Friday 16th June. : Tangled cable..
To our great surprise we woke up to yet another sunny "day" with good cold temperatures. This was the day we would beat the record and drill and process even more than 30 m! It all went fine until after lunch when the cable on the winch became completely tangled up! Our Hans Tausen drill setup is designed to carry 300-400 m cable, and the winch is not constructed for the 700 m cable we are carrying. The sides of the winch drum were being pushed apart and the cable began to tangle up on rewind. 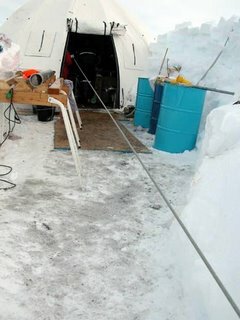 To fix it, we pulled the entire cable out on the surface with a snow mobile. Steff did a fantastic job fixing the drum, and the cable was rewound with a tension of 50-75 kg. And we had to make do with a daily production of only 21.3 m beautiful ice cores. We had real tortillas with chilli beans for lunch (chef Trevor) and a pork roast with potatoes for supper with raspberry-paste for dessert (chef Bo). We are now 209 m down into Flade Isblink. Another day with beautiful weather. After some further tests with the liquid in the newly drilled bore hole we started drilling. It was a productive day where we drilled 22.34m of core. We evaluate the drill liquid, and are sofar happy with it. We need the centrifuge 1-2 times pr. run, and the centrifuging takes 13 min. This is sofar the slowest part of the drill process. 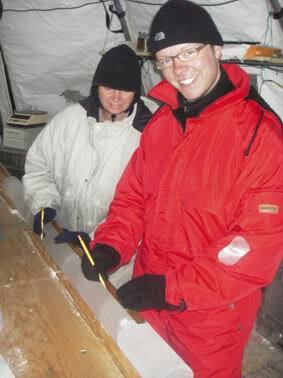 We drill and process the core in two shifts from 18 pm to 10 am in order to take advantage of the colder nights. The workday usually ends with a cold beer in front of the weatherport when the sun begins to warm at 10. We had chicken for lunch (chef Peter) and salmon with vegetables for dinner (chef Nancy). We have been in contact with Copenhagen in Kangerlussuaq. Wednesday, 14th June: The first "wet" cores drilled. Another lovely sunny day. 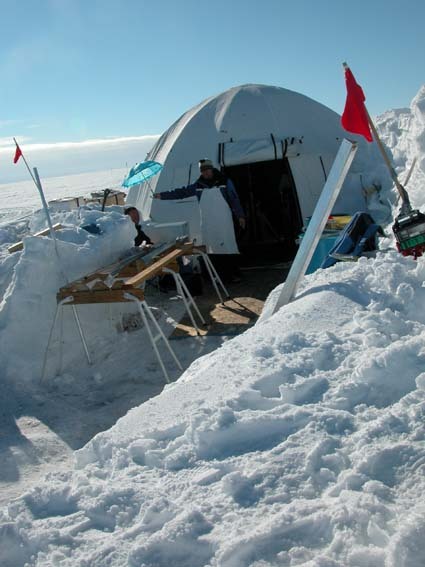 The camp is now in overall good shape, but still small tasks remain such as sorting rubbish into piles of metal, glass and combustibles while the drillers conduct tests with the new and environmetally friendly drilling fluid which we plan to use in future deep ice coring operations. The bulk of the fluid consists of a coconut oil derivative so both drillers and the drill have to get used to working with this rather lubricating substance. We conducted pull and drop tests in the bore hole. Different zones in the hole with different diameters (126.6 mm and 134.0 mm) had been prepared, and the tests were done with both open and closed valves in the drill. The fluid is more viscouos than we are used to, but on the other hand the fluid does not smell and there are no environmental issues. During the tests, the inner core barrel detached itself and fell to the bottom of the hole. It was easily retrieved, and it demonstrated that the core barrel locking mechanism (which is meant to be able to unlock by remote control, and is part of the safety system of the drill) needs to be adjusted to compensate for the increased lubrication effect of the new fluid. 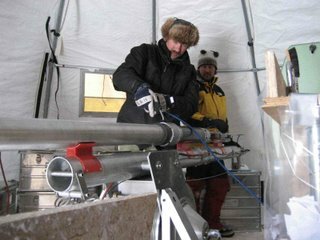 At the end of the day we were able to drill a few cores which came up long and perfect. Cleaning the cores for excess drill fluid turned out to be an easy operation, although the cores were a bit slippery at first. 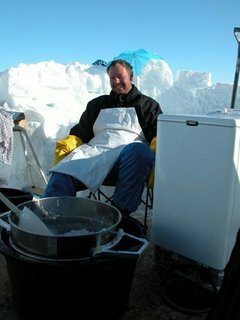 We have a commercial laundry machine for spinning the wet ice chips to separate the fluid from the chips in order to re-cycle the fluid. However the spin program of the laundry machine takes 13 minuttes, and as we produce two loads of chips per drill run, it takes time. We stopped working after supper, and people in camp are very satisfied with the new fluid and the nice soft coconut oil treated hands obtained. For lunch we had fried chicken with bean salad and mashed potatoes (chef Nancy) and for supper we had a special: Icelandic Lamb prepared by Sigfus and Thorsteinn. During our "night" a U.S. C130 visited Station Nord, but a feared low altitude pass over camp did not occur. Weather: Sun, little haze, no wind and -8 to -6 C.
We woke up to an overcast. We have rime and it feels like being in the middle the cloud that sticks to Flade Isblink. We have no wind and good low temperatures. We undug all drill fluid and fuel drums from snow drift and we estimate that there is enough fuel left for the last weeks in camp. We spent the day preparing the drill for drilling in liquid and set up facilities for collecting the liquid from the drill and clean the drill and the ice cores for drill liquid. The first 400 l of the new drill liquid were mixed and put into the bore hole. We now have to wait for the liquid to cool from the -5 deg at the surface to the -16 deg at 160 m depth in the bore hole. 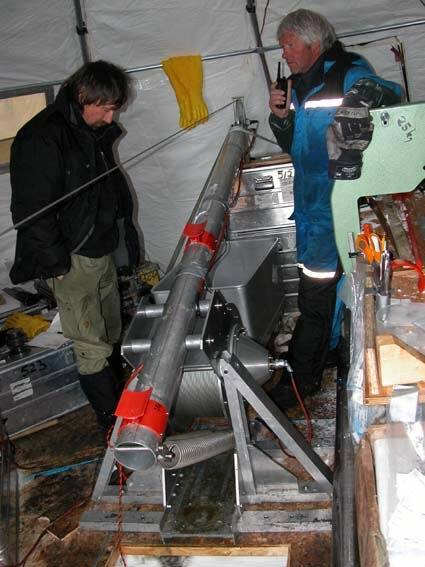 In front of the drill tent there is now located a centrifuge to be used for extracting drill liquid from collected ice chips in order to recycle the liquid. 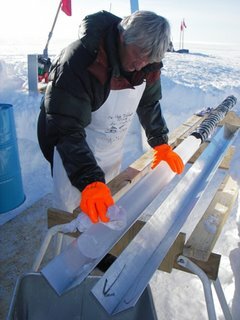 In the morning we also labeled coulter beakers to sample three parallel profiles within a 3 m deep snow pit close to the bore hole. 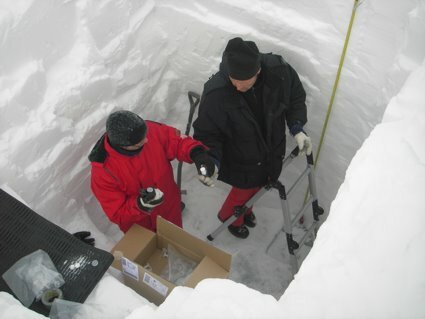 After lunch we dug out the pit and took the samples. For lunch we had left over lasagne, for dinner we had a curry fish pot and blueberry cake with cognac cream (chef Dorthe) and after dinner we went to the movies to watch 'Ghostdog'. We had a most fantastic Sunday with sunshine, no wind, and -10 degrees C. We had a clear view in all directions and could see the mountains in the horizon. We spent the day cleaning up in camp and adjusting the weatherport to make it horizontal again. There had been so much melting below the weatherport that it had started to sink in the middle. We expanded the area in front of the drill tent and started to prepare for the use of drilling liquid. We spent all day reaming the remaining part of the bore hole. It went fine even if Steff and Sigfus had to take care that the reamer would not get stuck because the motor got warm and had water on it. A couple of hours after dinner we finished the reaming down to 148 m depth. We had decided to leave the deepest 15 m with the original diameter so that the viscosity of the new drilling liquid can be tested at both diameters. We got late breakfast with eggs and bacon (chef Nancy) and lasagne with bread fait a la maison (chef Bo). Despite of being Sunday, this is actually the Saturday dairy. We woke up to a windy and grey day. 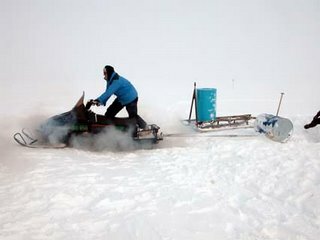 Weather was however good enough to allow for a trip down to Station Nord to give back the skidoo we had borrowed there. At Station Nord they were slightly surprised to see us arrive around midnight, but Lars and Sverrir were kindly offered a glass of wine in their own quarter. 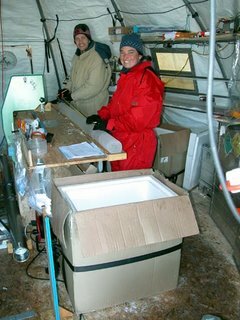 In camp the day was first spent logging the bore hole temperature. 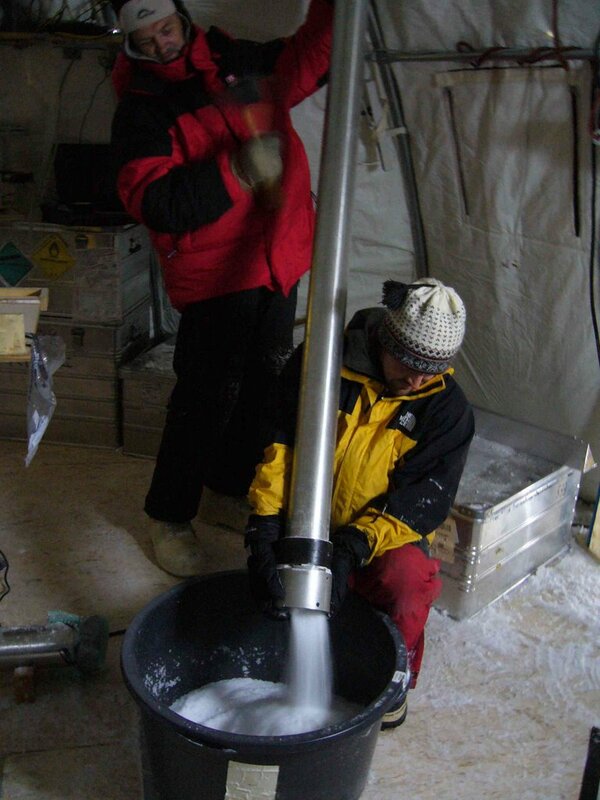 At 130 m depth the temperature is -16 degree C. Then the reaming of the hole started. The hole needs to be expanded by 3 mm in order to change from drilling in a dry hole to drilling in a liquid filled hole. 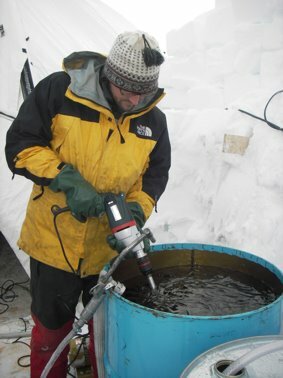 The reamer (see pictures) cuts away from the side of the hole and Steff can remove 4 m at a time until the reception tank is full of ice chips. We reached a depth of 40 m before 4 am when our Saturday night could start. Lars has birthday and we started at 4 with cake and champagne (that we got from Station Nord). We sang birthday song and Lars got presents: a small umbrella in case it will start raining on Isblink and a present from home with good CD's. We got marinated king prawns with avocado dip, fillet of beef with bacon, new potatoes and pepper sauce (chef Lars). We played Meyer and had a nice evening slightly marked by day and night being up side down. Now the diary skips half a day because we've started working at night. We have changed to New Zealand time or 12 hours delayed as compared to Greenland east coast time. We wake up and have breakfast at 5 pm. We start drilling and processing at 6 pm. Lunch is at 10 pm, dinner at 6 am and work ends at 9 am, whereafter we all go to bed. We have split in 2 drill teams and 2 processing teams and we succeeded in logging, measuring and packing 60 bags (33m ice core) today. 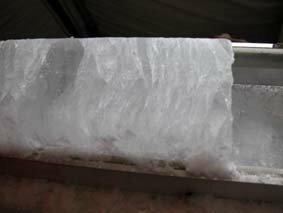 The core quality is varying with thick layers of waffly ice (see picture). We can see that the melt layers are fine whereas the normal ice with air bobbles is waffly because the pressure in the bobbles makes the ice brittle. Generator 2 has been repaired using the spare parts that were brought up to camp and we run on generator 2 when the drilling goes on. The catering has been excellent as usual with pasta and meat balls in tomato sauce for lunch (chef Trevor) and chicken with rice and vegetables for dinner (chef Peter). The GrÃ¸nlandsfly Twin Otter with Flemming and StÃ¥le as pilots fueled right after breakfast and the departing team took off at 9 am. Many hugs and kisses were exchanged before JÃ¸rgen Peder, Simon, Andreas, Bruce, Claus and Dennis started the impressive flight down the east coast. 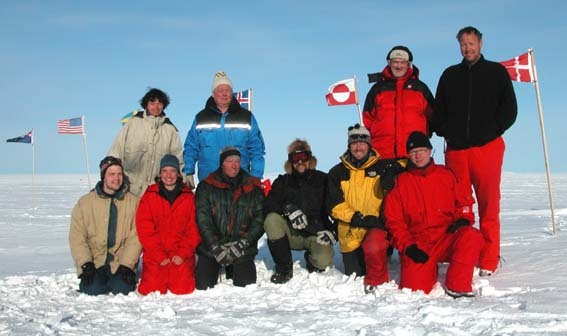 On this trip a stop-over was made at Danneborg with a delivery to the Danish sledge patrol in Northern Greenland, the Sirus Patruljen. A low camp overfly gave some nice photo opportunities. Thank you to Flemming and StÃ¥le for providing such nice weather! The ten who will stay in camp to the end are: Dorthe, Sigfus, Steff, Sverrir, Lars, Nancy, Trevor, Bo, Peter, and Thorstein. We spent some time at Nord to try to repair one of our skidoos that was broken, but it didn't work out. Instead it was possible to borrow one skidoo from Nord and we started the trip up to Flade Isblink. After two trips everybody were up in camp at 20 pm. The menu that evening consisted in fresh strawberries, Danishnish potatoes, asparagus, and roast beef. Mum. We made a big decision to turn up side down day and night in order to sleep during the (too) warm hours in day time and work at night. From 10 pm to 1 am we drilled three cores that were logged measured and packed so that everybody could see how it is done. 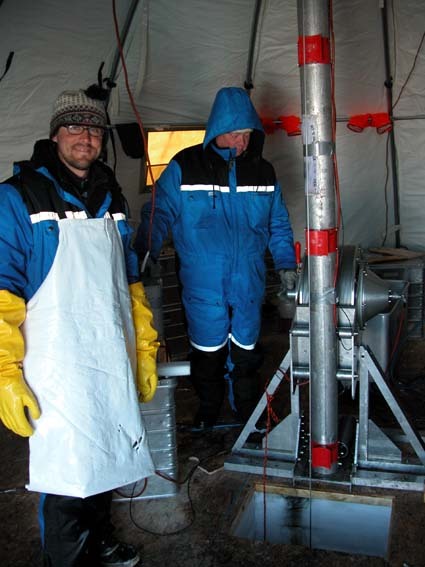 The cores look very nice and it is difficult to see that we are actually at 130 m depth. We guess that the melt layers and the warm temperatures together with a well-tuned drill that provide the beautiful cores with no breaks. The plan now is to sleep as much as possible during Friday, have breakfast at 5 pm, and start drilling and processing at 6 pm in two shifts until 10 am Saturday morning. Finally, the big exchange day arrived. Team 2 flew from Kangerlussuaq to Station Nord and team 1 went by skidoo from Flade Isblink to Station Nord. Team 1 reports that the 40 km long skidoo trip is rather bumpy! In particular the last 20 km across the ice cap are bad. There is a rather strong 'sastrugi' pattern on the surface that provides a good shaking of the kidneys. The trip offers an exceptional view of Isblink down to the sea. It took two return trips to move everybody from the camp down to Nord and everybody were nicely cleaned before the Twin Otteren arrived! Team 2 had a beautiful flight. First 5 hours from Kangerlussuaq to Konstable Pynt and then 5 hours up along the Greenland east coast under a clear blue sky. Team 2 came to Station Nord at 8 pm and for the first and only time all the field participants were together. It became a nice evening at the bar where many camp stories were told. Clearly team 2 will have something to live up to. A super dinner was provided from Station Nord. 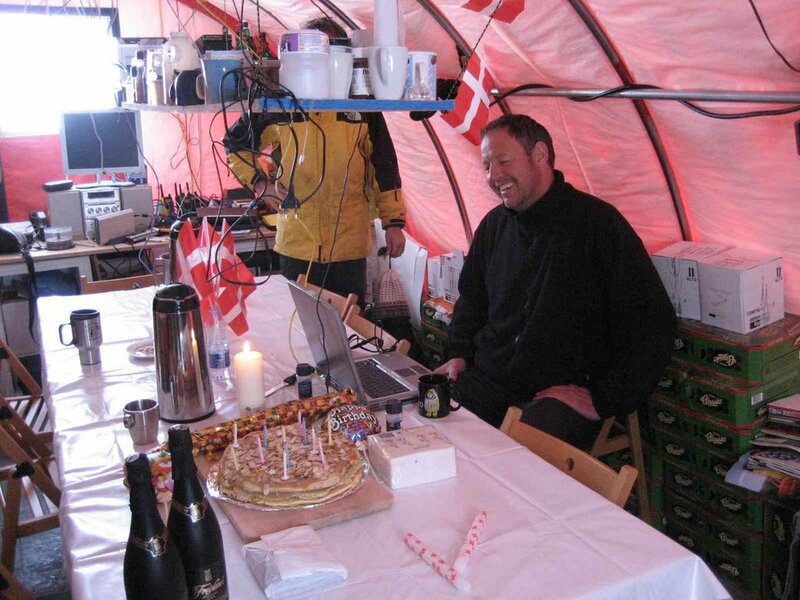 We would like to thank the crew at Station Nord for warmly welcoming the 15 of us. Thursday, 6th July: Cargo is re-packed and dried.